If you want to rent a holiday home in Thailand for your vacation this amazing villa is one of the finest of Hua Hin. This villa is located on the guarded complex of the Banyan Estate Hua Hin at the Banyan Golf Club. This is one of the finest golf courses in Thailand. Hua Hin is located some 200 kilometers south of Bangkok on the west coast of the Gulf of Thailand. It is the oldest and most traditional Thai resort and holiday destination in Thailand. Hua Hin was the home of the beloved Thai king. This wonderful home is suitable for 8 persons. The villa is built with the finest materials and has four bedrooms, two bathrooms, living room with open kitchen, a separate TV room with flat screen TV and DVD player, kitchen with dishwasher and microwave / oven. Twice a week a maid who cleans the house, prepares the beds and thus ensures that you will enjoy your holidays in this villa. From the entrance of the house you reach the patio in the middle of the villa. This patio with palm trees gives access to four double bedrooms, the TV tower and the living room. 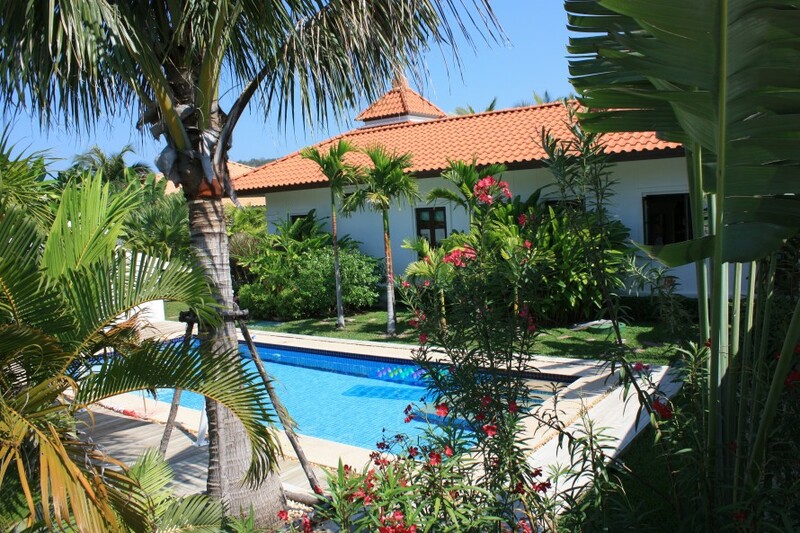 The villa has a private pool of 4 times 10 meters. The pool is located next to the house to ensure maximum privacy. The pool is surrounded by a tiled deck with sun loungers. The villa has a large covered terrace with teak furniture. The adjoining tropical garden is densely planted and offers complete privacy and shade. The Banyan is by far the most beautiful estate in Hua Hin and surroundings with the best quality homes and amenities. We are happy to answer any of your queries and supply information about our accommodation. Get in touch with us! "Fantastic house and atmosphere! We've been having lot's of fun! Splendid weather. Lovely people. When can we come back?" "We stayed in the villa in October 2011. The villa was of extremely high standard in terms of furniture, utensils and layout and was spotlessly clean throughout. The location and view were also fantastic. This villa represents exceptional value for money for those looking for great accommodation in a great part of Thailand."